Forty years ago, the Radisson was one of Duluth’s first new hotels to locate close to the newly built DECC [Duluth Entertainment and Convention Center], that was back in the days before big brands started buying naming rights for large public structures. Today the Radisson hotel gave a sneak preview of the revamped restaurant at the top of their 15th floor. The “Top of the Harbor” has undergone a complete change. It has been gutted and a new chef has been hired who will revamp the menu with locally grown foods and sustainable fish. And it’s new name, JJ Astor, reflects the American industrialist’s ties with Duluth. [John Jacob Astor built his fur post next to the Ojibwe village in Fond du Lac, 20 river miles from the lake, and operated it for three decades, until 1847. When financier Jay Cooke brought in the first railroad, it came in along the banks of the St. Louis.] See Midwestweekends.com Duluth’s Other Waterfront. The restaurant will have both a nautical theme and a JJ Astor them. Above shows the degrees of a compass which are all around the the 360 degree view restaurant. 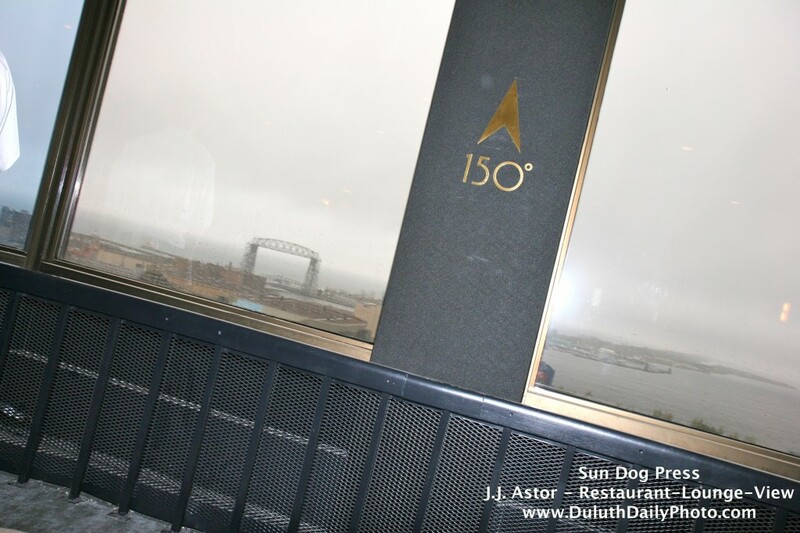 The JJ Astor Restaurant, Lounge, and View will open June 9, 2010 in the former Top of the Harbor Restaurantâ€”Duluthâ€™s 40-year old landmark revolving restaurant with a 360-degree view. Â Full of old world character and spirited tradition with a fresh modern irreverence, JJ Astor will be a lively place to share old stories, create new memories, and savor signature dishes made from sustainable local food. Â Located at 505 W. Superior Street , Top Floor, Duluth , Minnesota . Â For more information call 218-727-8981. As you can see, today was a rainy day. And I learned a lot about J. J. Astor.Â He was from Germany, his father was very hard on him, a Lutheran minister befriended him and helped him escape to London and the New World. He is also buried in Trinity Cemetery, which I found interesting as the New York based firm that owns the hotel is named Trinity Investors LLC.